Between August 1st and August 15th Madrid celebrates the popular festivities of San Cayetano, San Lorenzo and la Virgen de la Paloma, which offer a wide range of cultural, music and sport activities. 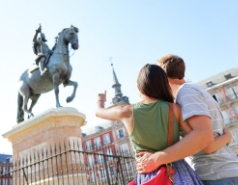 You can enjoy these festivities with Madrid City Tour. Bus stops such as San Francisco el Grande or Catedral de la Almudena can take you to the Distrito Centro -central district-, from where you will be able to go to the quarters in which the celebration takes place: Lavapies and Las Vistillas. 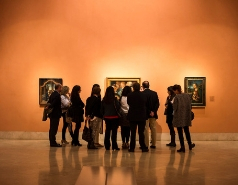 The attendants will be able to enjoy an amusing agenda based on the most authentic characteristics of Madrid’s culture. This culture cannot be understood without elements like the delicious lemonade, the chotis dance or the chulapos parade. What is more, and like every year, the attendants will be delighted to enjoy the “Concurso de Engalanamiento” –quarter decorating contest-, which consists in adorning balconies with typical charming decorative elements, and the “Personajes Castizos” contest, which consists in dressing up like legendary Madrid’s characters such as La Casta, La Susana, La Maja de Lavapies, Don Hilarion, El Julian and la Seña Rita. 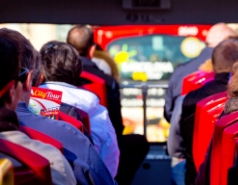 Going to Centro aboard one of our buses, hopping off it for a walk while enjoying this amazing festivity and taking another bus to enjoy many other places of Madrid using our Hop On Hop Off service seems like a good plan for a summer day.